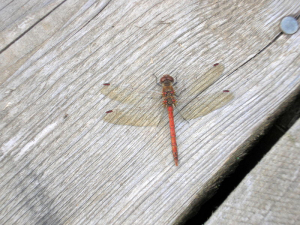 Observation - Common Darter (Sympetrum striolatum) - UK and Ireland. Description: i think this is either an immature male or a female due to the orange brown body,i understand that in the adult male the body is blood red. i think this is either an immature male or a female due to the orange brown body,i understand that in the adult male the body is blood red.